Did you know about this setting on Facebook? Today’s message is a short one but I think you’ll find it super helpful. I found something out about Facebook I didn’t know before. Our news feed on Facebook can seem random, unpredictable,and just plain mysterious, and you probably feel like your page just doesn’t reach to your followers. Well, now there’s a feature that can help your followers see your updates. It’s called the ‘See First’ button. I have a sneaking suspicion that Facebook doesn’t want you to know about it because I’m surprised I haven’t learned about it yet! 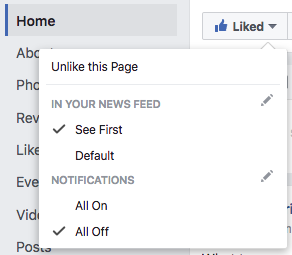 What it does is show selected pages in your news feed first, making sure your true followers never miss an update. Now, it’s up to you to tell your fans how they can keep up with your music. Post and share to your social media profiles and mailing list! Make it even more fun with a phone or video on your wall – video is usually best – instructing your followers on how to see your updates first! Boost it to your followers for a few dollars to make sure everyone sees it.